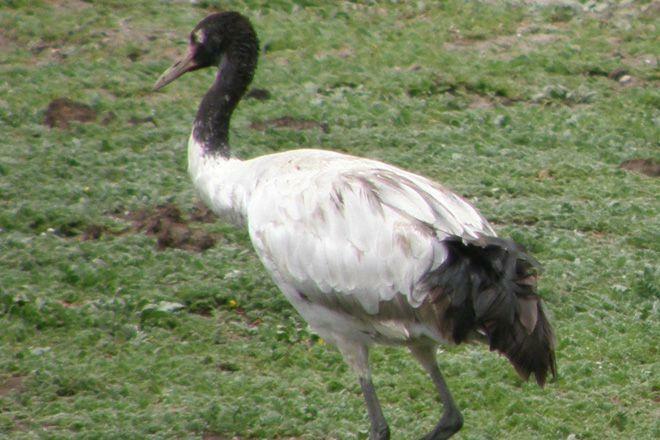 Those on Bhutan treks during November may be able to enjoy the annual Black-Necked Crane Festival, if Gangtey Monastery is on their route. Every winter the cranes return to the Phobjika Valley in Bhutan from their summer breeding spot across the Himalaya in Tibetan wetlands, remaining until February. A festival is held while they are returning; this year it’s taking place on 11 November. According to Bhutanese belief, the circling of cranes provides a special blessing. Crops of winter wheat are only planted after the fields have been blessed by the arriving cranes. Large numbers of locals attend the festival, as well as any visitors on Bhutan treks. Children dressed in crane costumes perform festive dances, while everyone hopes that some of the cranes will arrive while they’re watching. Their approach is first heralded by their calls, before they circle out of the sky to the wetlands below the monastery. While the monastery is old, dating from the 16th century, the cranes’ migratory patterns are older, with today’s cranes returning to an area that their ancestors have likely been visiting for thousands of years. Witnessing this ancient tradition will be a highlight of anyone’s Bhutan trek. Its future may still be at risk if conservation efforts are not continued, but so far organisations like the Royal Society for Protection of Nature (RSPN), established in 2003, are helping to protect these rare birds. If you’re planning a Bhutan trek for next year, the Black-Necked Crane Festival is definitely one to consider adding to your itinerary.